Other Ingredients: Rice protein concentrate, rice syrup solids, fructose, natural flavors, partially hydrolyzed guar gum, olive oil, medium chain triglycerides , silica, and rice maltodextrin. Directions: Shake the canister before scooping. 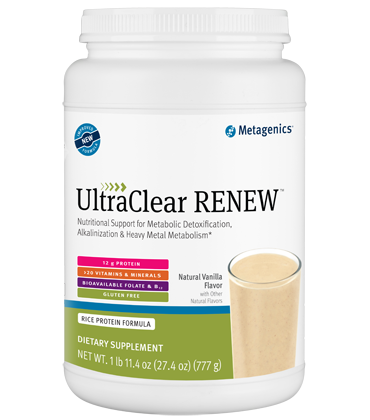 Blend, shake, or briskly stir about 2 level scoops (37 grams) of UltraClear RENEW into 8 fluid ounces of chilled water or juice twice daily or as directed by your healthcare practitioner. For highly sensitive individuals, consider reducing consumption to ½ to 1 scoop with 4 to 5 ounces of chilled water or juice twice daily during the first 3 to 4 days before starting a full daily dose. CAUTION: Do not use if pregnant or nursing. This product is non-GMO & gluten free. Contents sold by weight, not volume. Some settling may occur during shipping and handling. The amount of product contained in 2 scoops may be above or below 37 grams due to variations in handling and product density.